Your intelligent photo system attracting a maximum of customer attention. The PrintCenter has been the rewarded flagship of DNP’s retail photo systems. Being fully customisable, it features a set of three order stations, intelligent photo software to make printing fun for your customers and a self-service workflow including a secure payment mechanism that is simple to integrate to your stores. The PrintCenter is designed for large retail spaces like supermarkets, pharmacies and any high-footfall retail. It is set up as a photo island that will attract your customers and become one of your premium services. Together with the PrintCenter Light solution, the line-up is versatile according to the shops’ layout, size, and customer footfall. 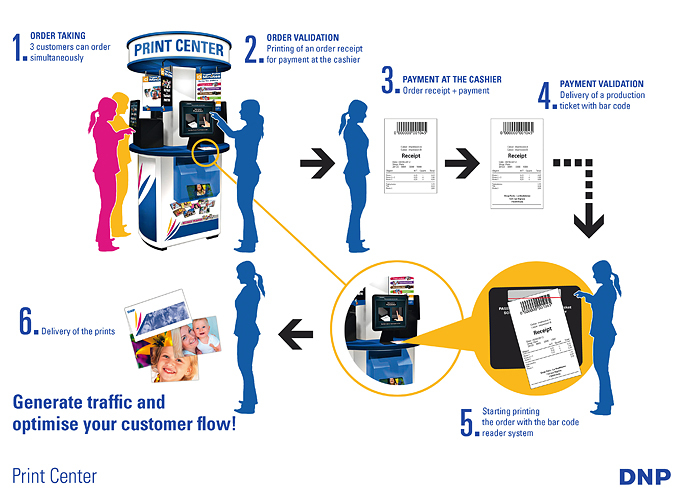 The PrintCenter comes in customised design for your fleet of stores. With a value-share business model (based on rent or click charge), you will make money with your PrintCenter photo service on day 1. No investment is necessary. Increase your profitability thanks to a whole range of services enabling the production of high added value prints like enlargements, calendars, greeting cards and more. By adding a photo service you have the opportunity to even increase the footfall in your stores and make more revenues.